Nature Presentations - Live Animal & Multimedia Nature Presentations & Story Time, "Story Time With Captain Flint!" For Young Children, For Older Children, For Adults! Captain Flint is our own blue and gold macaw parrot, named after pirate Long John Silver's parrot in the children's classic, Treasure Island. Younger Children -­ Story Time with Captain Flint! - Captain Flint loves to be read to. The endearing personality of Captain Flint helps young children to stay focused on the story as Jackie & Clifton read to Captain Flint and to your children. Multimedia and Interactive! - To help your children follow along, the books featured have their pictures projected so that your children can follow along with the exciting and entertaining tales! Fun, high-flying and educational Bird Silhouette Kites © designed by Clifton are constructed by the children. Older Children -­ Wild Birds of the World! ­ For older children the story time books are intermixed with fascinating information and photographs about wild birds of prey and about macaw parrots and the rain forest, including stories and photographs about Clifton's cousin, leading field botanist Dr. Alwyn Gentry (links    ) and other scientist's critical research in the rainforest. The presentations can be mixed to meet the interest of the age group. Adults -­ Conservation & The Rainforest ­ Captain Flint serves also as Ambassador of the Rainforest by helping to tell the story about the endangered condition of the animals and vegetation of the rainforest. Captain Flint helps people understand that while talk of a global economy is important, just as important or more so is the importance of global conservation. Bring Story Time with Captain Flint! to your group!- Entertaining, Enchanting, & Educational to watch! - People used to expect that larger brain size indicated higher intelligence. Studies of parrots are indicating that something else is going on! See this for yourself! And see the rainforest through Captain Flint's eyes! Whether your group is young children, older children, or adults, you will be amazed to have us present to your group, Story Time with Captain Flint! Experience this for yourself, and learn about one of the worlds most beautiful, intelligent, and endangered species! Phone or email Clifton or Jackie about scheduling and planning a presentation for your group! 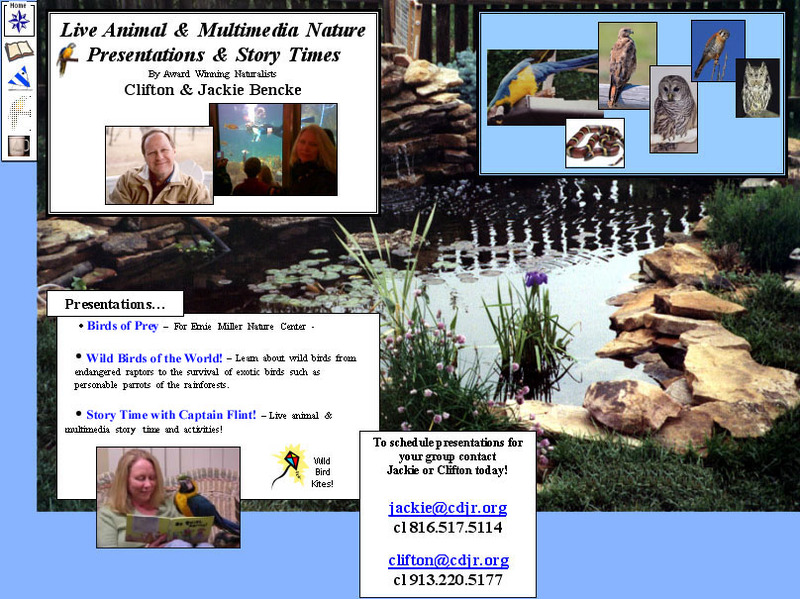 Jackie & Clifton are among the naturalist with the Johnson County Parks, Ernie Miller Nature Center. 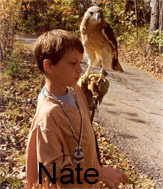 Their work includes helping to care for the raptors and providing presentations on Birds of Prey. 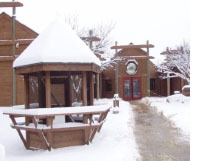 The presentations can be seen at the nature center or scheduled at your location. Wild Birds of the World! Jackie grew up as a city girl with a country heart. As a child she explored the creeks & critters in her neighborhood in south Kansas City, Missouri. When she was a teen her folks moved to a place in the country which had a large pond that she and her younger siblings expanded their exploration on. When not exploring there she'd most likely be found on her grandfather's horse which he kept at a stable in Olathe. Her family made many family vacation canoe trips on the clear and rapid streams throughout Missouri. What with her love of the water Jackie extended her exploration to under water when she started scuba diving in her 20's. She dove and explored the undersea world in places such as Cozumel, Mexico, Dry Tortugas in the Florida Keys, various locations along the Florida Atlantic coast, and Cancun, Mexico. As a young adult she developed an interest in photography and nature photography. Later, while raising two boys on her own and now living in Olathe, she found what a treasure Ernie Miller Nature Center was. Their family activities there started with her boys participating with first the preschool programs then later the day camps. Soon Jackie was getting actively involved with the nature center herself, working with the care of the raptors and critters then becoming a volunteer naturalist, giving presentations on the Birds of Prey and Reptiles. Jackie's sons are also volunteers at the Nature Center. In 2002 Jackie and her youngest son, Trent, were awarded Volunteer Employee for the Quarter for their hard work and dedication to the Nature Center. an occasional visiting Great Blue Heron! 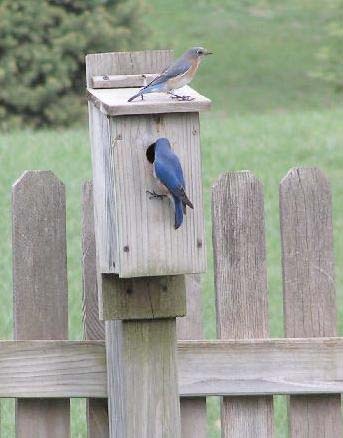 A family of Eastern Bluebirds has taken up residence in the birdhouse on their north fencepost and indoors the family has more critters such as Duchess their Standard Poodle, a colorful scarlet Milk Snake, tropical fish aquariums, and the most recent member of the family, Captain Flint, the wild but personable and entertaining blue and gold macaw! In marrying Clifton, Jackie and her boys have become sailors, each having a natural hand on the helm of the family's 23-foot cutter-rigged sailboat, The Cutwater. Although like many young people, the boys enjoy equally or more, their total command of the smaller boats such as the 14-foot Sunfish. In Clifton learning about Jacqueline growing up, she became the inspiration for the "Jackie" character of the Carolyn & Doyle, Jackie & Ray © books. As a teacher or parent, do families in general get enough face time together? What are you seeing in families? What is the impact on U.S. families? Among others, I will share the answers with First Lady, Michele Obama and the "Let's Move" initiative. Please share this email/posting with other teachers and parents, either through your email, or on your FB or G+ page. About Clifton - Clifton has spent his life exploring the world and nature, then sharing what he's found with others. Growing up in the Kansas heartland gave Clifton's family a home-base to explore the country and experience nature! Explore the country they did with extensive camping and boating, water-skiing, snorkeling, a little scuba, and with sailing! As a youth, Clifton enjoyed family vacation trips from Vancouver Island & Seattle, Washington to the Florida Keys, from Tijuana, Mexico and San Diego, California to New York City, exploring all of the national parks and every other park they could find in between. As an adult, exploring nature and the world has become part of Clifton's life! His day-job was building and installing computer systems. This work expanded his travels further in the U.S, and took him across oceans with projects to Germany, Denmark, Norway, England, and the North Sea. His work eventually took him on an adventure which accomplished something Columbus only dreamed of doing, voyaging completely around the world (by air for Clifton); Oklahoma to England, Norway, Moscow, Japan, South Korea then on to home! With his passion for sail he's searched out opportunities to explore the decks of many famous sailing ships including the Cutty Sark in England, the U.S.S. Constellation in Baltimore, a replica of Columbus' Nina and many others. Teaching & Writing- Clifton began sharing his passion for the outdoors with others beginning in 1977 when he started teaching sailing through the Red Cross. This led him to teaching sailing along with other outdoors skills to youth and adults. This includes skills such as camping, and astronomy (creating an exciting presentation, Star Treks; Exploring Space From Your Backyard Spaceship © ) Clifton also teaches canoeing, mountain biking, orienteering, metrology and other topics. As a child, and later with his own daughters, he got to know many critters including turtles, snakes, squirrels, tarantulas, tropical fish, Madagascar hissing cockroaches, parakeets, and most recently, a blue and gold macaw parrot. He's shared his experiences, teaching through such organizations as the Girl Scouts, Boy Scouts, Campfire Boys and Girls, public school community education courses, BOW (Becoming an Outdoor Woman) and others. He's been a camp counselor, a substitute teacher and a marina manager. Currently Clifton is reaching beyond the horizon to even more children by getting a series of children adventure books published featuring the characters Carolyn & Doyle, and Jackie & Ray ©, the continuing adventures of a "pet" parrot, a rescued wild Redhead duck, and an eleven-year-old girl and boy who are seeking their own sailing adventures at a fictional boating resort called Treasure Cove. After marrying Jackie, Clifton was naturally drawn in with her work with the Ernie Miller Nature Center. In training to work with the birds of prey and in looking for ways to better communicate to young and old about raptors, Clifton created the Bird Silhouette Kites ©. His goal was to combine a quick-to-build, easy-to-fly kite with the silhouette of various soaring birds resulting in a creative, energy-burning activity for youth where they also have the opportunity to learn to identify birds in flight.